You know what it's like to eat a birthday cake, but have you ever wondered what it's like to be inside of one? The Birthday Cake Bounce looks like a giant yellow cake with colorful, striped candles on all four corners. 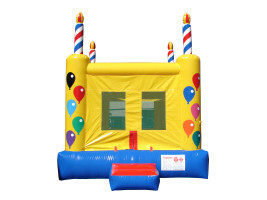 It's a delicious addition to any bounce house birthday party!